I make derivations of this for cocktail parties all the time. They're a good match for strong drinks or beer and good well with hearty cheeses before dinner. This recipe makes enough as an appetizer for a dinner party of 4 or 5 people. 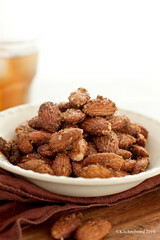 2) Toss nuts in oil and then seasonings. 3) Spread on baking sheet in single layer. 4) Roast for 15 to 20 minutes. Keep an eye on them so the sugar doesn't burn. 5) Remove from oven and allow to cool completely before serving. I had a large carrot sitting around that I needed to use up. 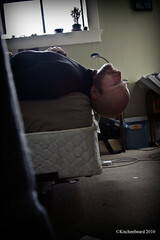 It would have been easy to stand around the kitchen eating peanut butter out of a jar with it, but I wanted to do more. Making the standard carrot salad was also not an option. A few minutes standing in front of my pantry brainstorming and I was ready to go. 1) Mix tamari and mirin and microwave for 30 seconds. Pour over currants to rehydrate. 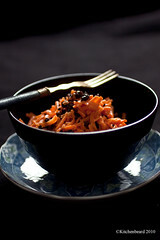 2) Drain liquid off currants and mix currants into carrots. 3) Mix tamari mixture with yogurt and spices and sesame oil until fully blended. 4) Pour dressing over carrot mixture and mix well. 5) Allow salad to rest for 2 hours to allow currants to fully hydrate. 6) Garnish with nigella seeds before serving to provide a hint of bitterness.